This is my sons' FAVORITE show - they were SO disappointed b/c our local station didn't air it today (despite advertising it). I have 3 fanatics here, who'd love this. 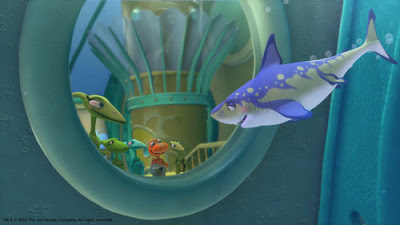 My son loves Dinosaur Train and loves ocean animals! 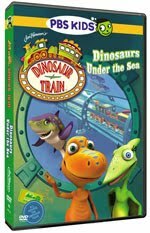 We love the Dinosaur Train and our own DVD would be even better. We want to win because we love Dinosaur Train! Thanks for hosting this. I think it's really neat that you are giving this away. My son can watch The Dinosaur Train alllll day! He loves it. The under the sea one sounds pretty cool, I think I will enjoy watching it the same as him! We love Dinosaur Train. We missed the special, so we would love to have this DVD. I think my grandson would enjoy this a lot! I'm following you on twitter (someluckydog) and tweeted! Oooh, we haven't seen any of the new episodes under the sea yet. We'd love to win a copy! My kids would love this, especially my daughter. We love Dinosaur Train! This episode was on Friday on PBS, but we couldn't watch it because of the rain :( Thans for the great giveaway! My son loves Dinosaur Train, especially the Under the Sea episodes. He'd love the DVD! They sound like wonderful episodes! I love how informative the show is too! This is our third visit to this blog post today! My three-year-old LOVES Dinosaur Train and wants to see the picture of Carla Cretoxyrhina over and over. Best of all, she corrected MY pronunciation! My little grandkids would love this! This DVD looks like a fun one for the kids to watch. Thanks. We're big fans of Dinosaur Train at our house. My son loves dinosaur train. I didn't realize they had dvd's with episodes on them. This would be perfect for our fall roadtrip to keep him occupied. I would like to get this DVD for free for couple purposes: being a child at heart and interested of the design of the characters. This looks really cute. My little boy would enjoy it.